A three-hour telecast delivers a ton of commercial breaks, the best part of attending an awards show… especially one where the booze is flowing. Beginning with cocktails at 3:30 p.m. on a Sunday afternoon, here’s what you did not see inside Barker Hangar in Santa Monica during the A&E telecast of the Critics’ Choice Awards. “This Is Us” star Chrissy Metz is by the DJ booth. Before the Globes Globes, SAGs, and Emmys, this is the first time the hit new NBC drama has been on an awards ballot. “No, I’m not nervous,” she told TheWrap. Producer Bill Mechanic and the “Hacksaw Ridge” team had a front row table. He said he told Lionsgate, “It would be nice if [winning] wasn’t a surprise.” He said that the film’s awards challenge is to “get the stink off of it,” presumably a reference to director Mel Gibson and his pariah status in some Hollywood circles. “La La Land” director Damien Chazelle at table 3 could not be closer to the stage. Later when the film’s Justin Hurwitz won for best score off-air, Chazelle turned around and high-fived him. “Have you seen Justin [Timberlake]?” a photographer working the talent pit asked. She must know he got the best slot of the night (first) and could be out the door soon. “Nocturnal Animals” writer-director Tom Ford huddled with publicist Simon Halls as Fox Searchlight President Nancy Utley squeezed by. “Deadpool” and “Silicon Valley” star T.J. Miller’s monologue fell flat in the room. The energy was low. “Like nails on a chalkboard,” one voter commented. Score one for “Arrival.” “Holy s—!” screenwriter Eric Heisserer shouted as his name appeared on screen in the graphical roll of winners. After winning the San Francisco Film Critics’ award earlier this weekend, he now has claimed his second win… and his second glass of wine, he said. 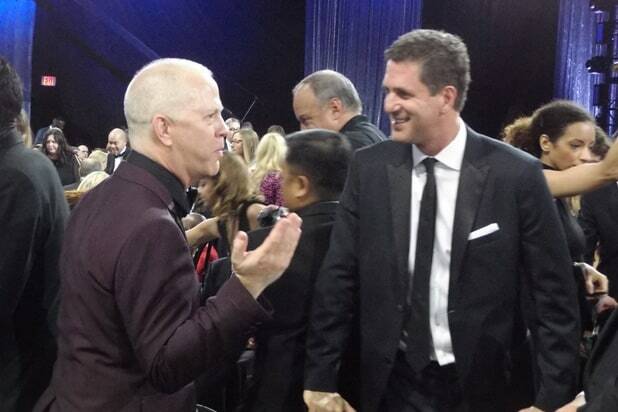 In the commercial break right after Courtney B. Vance and Sarah Paulson won for “The People v. OJ Simpson,” “Modern Family” producer Steve Levitan grabbed maroon-suited showrunner Ryan Murpy to offer congratulations. 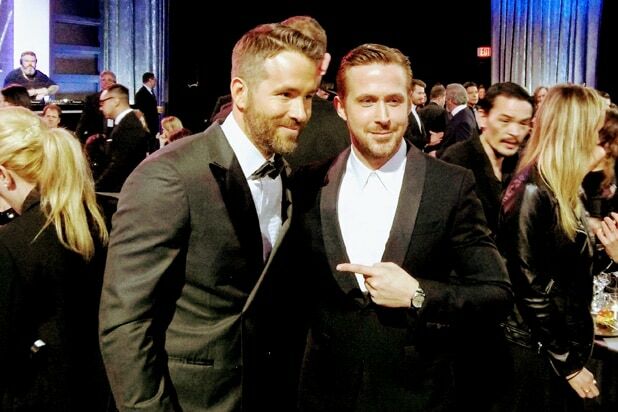 The Ryans — Reynolds and Gosling — spent a commercial break together. All the photographers hover. “All six people I know texted me,” Justin Hurwitz, the victorious composer of “La La Land” joked as he wielded his iPhone. He was seated with the film’s star, Emma Stone. “Loving” star Joel Edgerton hasn’t been social during the commercial breaks but jumped up to hug Best Supporting Actor victor Lucas Hedges (“Manchester by the Sea”). “Good on you,” Edgerton said. Hedges introduced his pal Finn Wolfhard (Mike from “Stranger Things”). “I’ve seen the first four episodes,” Edgerton told the child actor. An amber alert pushed to phones seconds before Natalie Portman won Best Actress for “Jackie.” Swaths of the room look at their phones in unison. A family man first, “Manchester by the Sea” producer Matt Damon made a late arrival to the show. He slid into the “Manchester” table. Perfect timing since the film’s star, Casey Affleck, won just minutes later. After “Atlanta” cast member Lakeith Stanfield crashed the stage during the “Silicon Valley” win for best TV comedy series, security rushed over making the “cut” sign and trying to eject him. An FX executive and Donald Glover negotiated to let him stay. They prevailed. The show is over, but the Golden Globe nominations arrive in nine hours. See what the biggest stars in showbizwore to the 2016 ceremony at the Barker Hangar in Santa Monica, Calif.